Not that you should, but you could probably play Halo on it. Just saying. 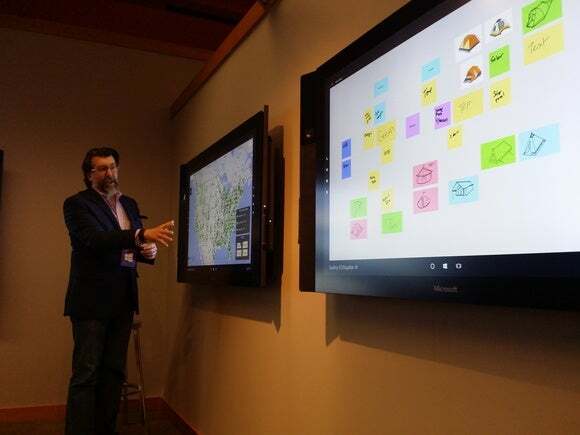 In January 2015, Microsoft announced the Surface Hub, a huge, touch-based monitor that served as the “hub” for team-based business collaboration. Almost a year and a half later, the Surface Hub is finally shipping. Microsoft’s Surface Hub isn’t for the average consumer. Available in two sizes ($8,999 for a 55-inch version, and $21,999 for an 84-inch version), Microsoft’s Surface Hub is designed to replace the whiteboard and videoconferencing system currently found in conference rooms where teams meet. 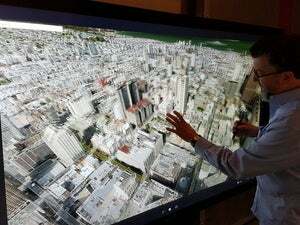 As for tech specs, Microsoft said last summer that the Surface Hub contains fourth-generation Intel Core processors (a Core i5 for the smaller model, i7 for the larger), either Intel HD 4600 or Nvidia Quadro K2200 graphics, 128GB of solid state storage, 8GB of RAM, four USB ports (USB 3.0 for two of them), Bluetooth 4.0, 802.11n Wi-Fi, and gigabit ethernet. The smaller model weighs 105 pounds, while the larger weighs a whopping 280 pounds. In its Redmond demonstration, Microsoft showed the Hubs mounted on walls as well as on stands. Microsoft was expected to begin Surface Hub production last September, but then pulled back, claiming that it was delaying production to manufacture the Surface Hub on a broader scale. The Surface Hub start screen. Why this matters: Microsoft hasn’t said much about the agenda for its Build developer conference next week. But with much of the company’s profits hinging on the enterprise and business customers—and we’d expect a hefty profit margin to be built into the $20,000 version of the Hub—it’s not surprising that Microsoft wanted to ship the Surface Hub in time to show it off in a big way at Build. So what does the Surface Hub actually do? You’d be forgiven if you’ve forgotten what the Surface Hub actually is. When we spent time with the Hub about 18 months ago, Microsoft had configured it to start up instantly, recognizing users as they approach the device through the integrated Kinect sensor. A screensaver interface offered three default options: a Skype call, a OneNote notebook, and connecting a third-party device such as a phone or tablet. The Hub includes a pen, and inking was as superb as with a Surface Pro 4. Moreover, there’s support for 100-point touch, so that more than one person can go hands-on at any given time. Finally, of course, there’s the collaborative aspect. The Surface Hub’s cameras point at eye level, so you feel more like you’re talking to someone in person, rather than their video image. 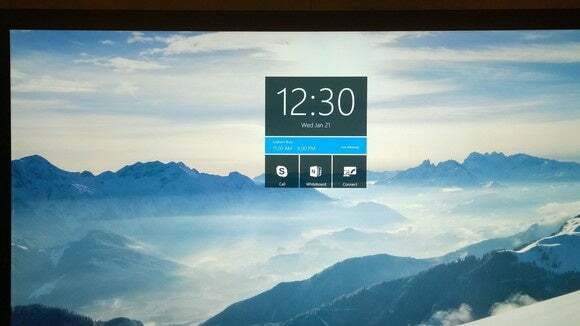 Naturally, Microsoft uses Skype for Business to connect participants, and the fact that the Surface Hub uses Windows 10 means that apps can be snapped to one side of the screen. There are many other digital whiteboards out there—the Smart Kapp IQ, for instance—but few offer support for whiteboarding, videoconferencing, and, of course, Windows 10. You can expect the Surface Hub to be one of the centerpieces of Microsoft’s pitch to big business.